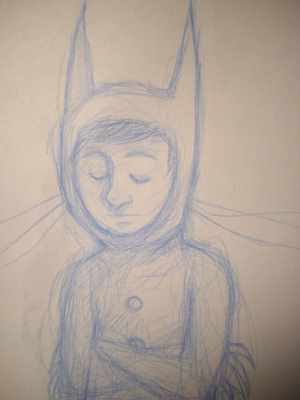 A while ago I found a little piece of blue chalk. 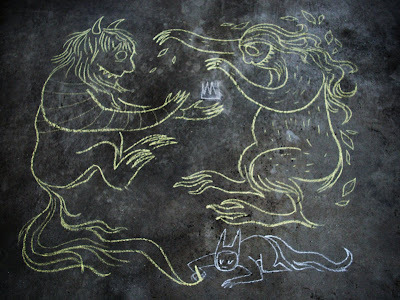 I brought it home and drew on the driveway with it. Erin ended up getting me a whole little tub of sidewalk chalk but then fall came and winter came and I never really used it. 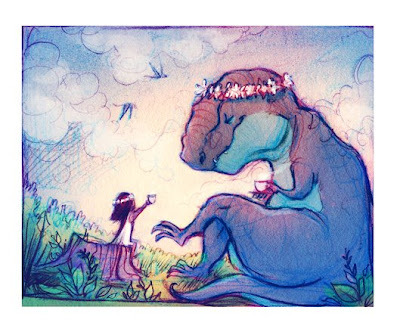 Click over to check out all the amazing invited artist contributions today!!! 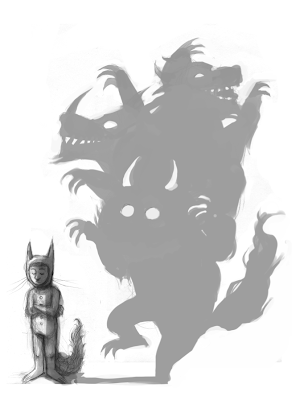 Here's a little teaser of my contribution for Terrible Yellow Eyes tomorrow. Be sure and check back tomorrow to see the full piece. Also we've got some incredible contributing artists tomorrow. It's going to be a good Friday for Wild Things! 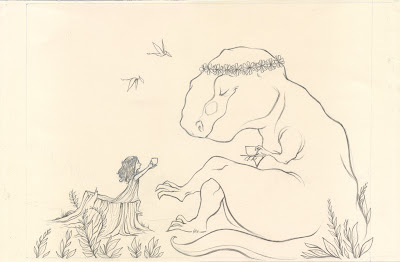 Here's a scan of the finished drawing for the Kale's commission. Once again, here's the color study. I'm just so pleased to be doing a project for someone that's almost exactly like what I'd be doing on my own. 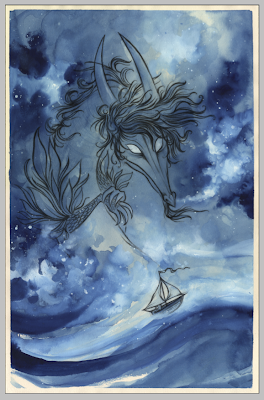 Again, so as to not abandon my blog while I focus on Terrible Yellow Eyes, I am posting the preliminary work for the new piece posted over there. 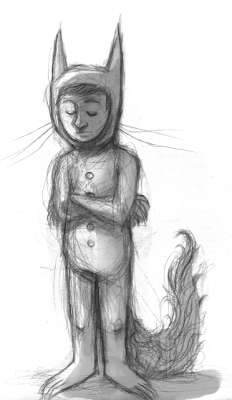 From there, I went and made this rough, a little tighter version of the above doodle. From there I went on to do the final drawing. 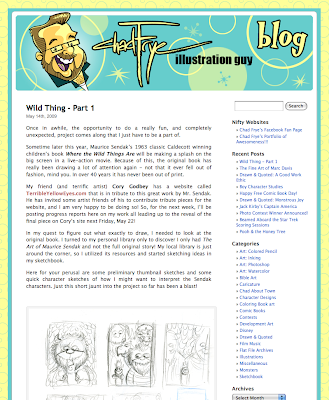 Click over to the see the final painting! Some color studies for the Kales. I think the first two are my favorites. Probably the second is my most favorite. A while back, you may remember, I was interviewed about Ticket. The good man on the other end of the phone was named Clayton. During the interview my phone died and unrelatedly, my lamp exploded across my desk. It was an exciting interview to say the least. 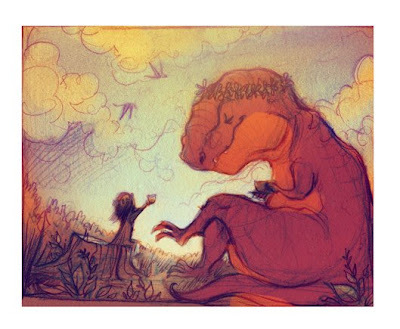 Clayton and his wife are expecting a little girl and they have commissioned me to do a piece for them - with dinosaurs! 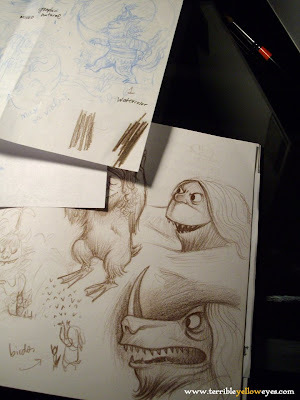 I'll be blogging the process here over the next few weeks. 1. 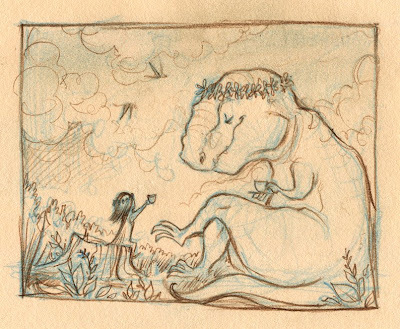 Collecting flowers : This has the girl standing on the head of a long necked dinosaur. 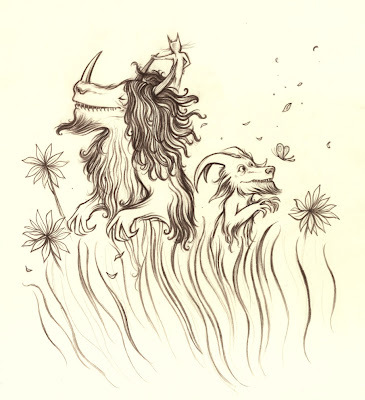 She's made a crown of flowers for it and herself and she's collecting more. There's flowers, butterflies, trees, vines. 2. 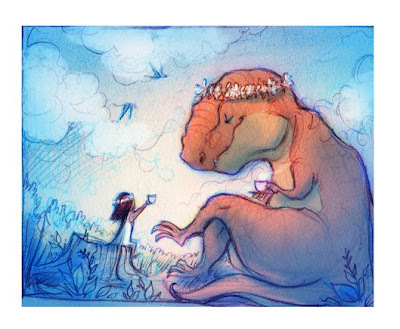 Tyrannosaur tea party : This has the girl toasting the dinosaur (they both have a crown of flowers, I just liked the image) clouds, warm day, pterodactyls flying in the sky. 3. 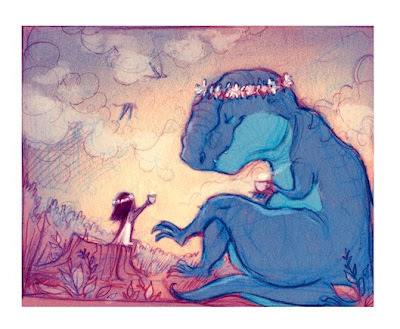 "Put it down" : This has the girl in a boat on the lake and a plesiosaur has risen up and picked up her boat. Girl's expression is cross, pointing down, to "put it down." 4. 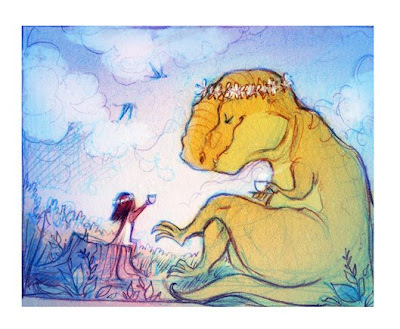 Triceratops Serenade : This has the girl, again in a boat this time with a friend serenading her on a guitar. Flying fish pop out of the water. Girl stands bold at the bow. Awesome! 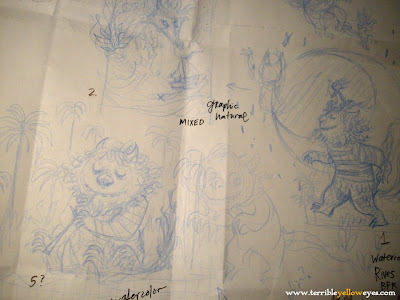 We scored a hot mention over on Irene Gallo's blog, The Art Department. Irene had some very kind things to say about my little project and I thank her. We can't hope to fill the shoes, but we sure do love them. Click over to see the final! Need to get your Terrible Yellow Eyes fix before tomorrow? You're in luck! 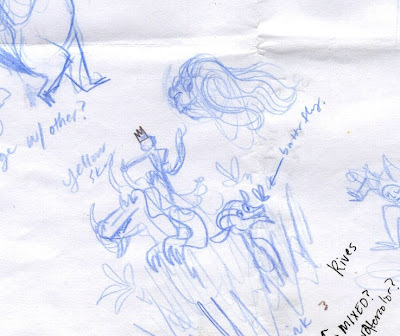 -- my buddy Chad Frye is blogging the creation of his contribution (which will debut on TYE next Friday) and has posted some of his work in progress roughs, and thumbnails. Joy! Where for art thou Zune Arts? This is a quick PSA. I noticed the other day that the Zune Arts site was down, gone, or lost to interwebs. 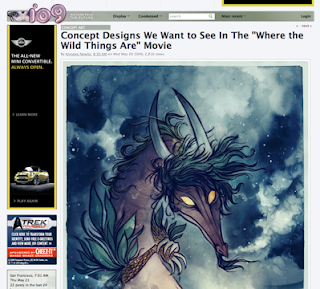 Since I had "le Cadeau du Temps" over on the sidebar the video was also down, gone, or lost to the interwebs. 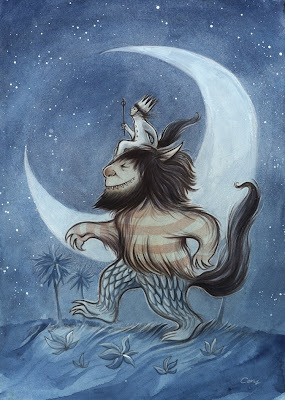 In a proactive move, I uploaded an HD version to vimeo to re-post on the sidebar. Unfortunately, it screwed things up a little. But. We've gotten The Gift of Time back, which is worth it to me. I'd like to dedicate this Tuesday post to my lonely visitor in the Atlantic. 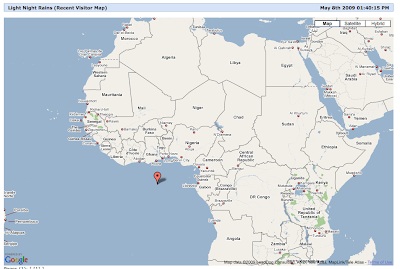 Thank you for checking my blog, even while in the ocean. Unrelatedly, I think, I have a nice Chinese speaking man named "Ed" who has been spamming the heck out of my blog with links to inappropriate materials. Just so you know, Ed is bad man. Do not click on his links. For the last few Monday nights I've been going to a life drawing class. I've been focusing on portraits and the face. Here are a few from the last couple nights that I liked. Drawing with a little digital value. Figuring the shadows in photoshop. Andrew Peterson is an all-around great guy, and possibly, even better writer. 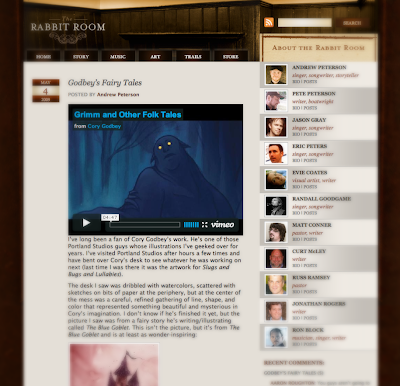 He did a little write-up about my recent Grimm show over his blog The Rabbit Room. "... all conspired to give me a flutter in the stomach that I only get when I’m at Disney World..."
I'll take it. Very kind. 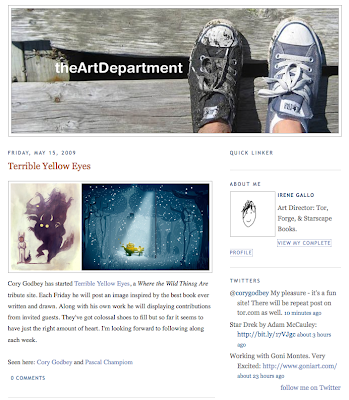 I want to be sure that my blog is not abandoned while I focus on Terrible Yellow Eyes for the next couple weeks. So, what I'll be doing is posting the work/studies here and the finals over there. 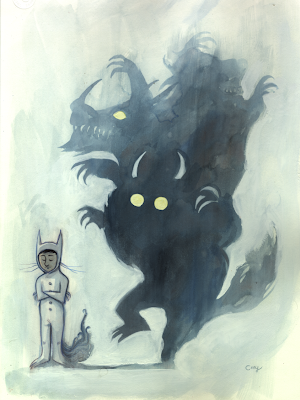 From my recent "Grimm and Other Folk Tales Exhibition" more information here. 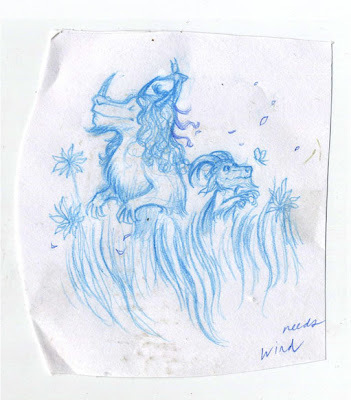 From The Three Billy Goats Gruff : to see the original, exhaustively documented development post for this piece go here. 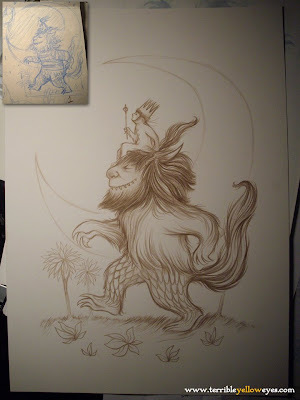 I enjoy imagining the troll's life, what he's like, and what's the hierarchy of the land. 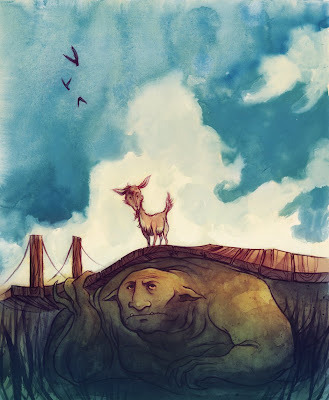 Obviously trolls eat goats, but the troll (upper class) is overthrown in the story by the goat (peasant) but is the troll necessarily the bad guy? Everything's got to eat something. Maybe he can't digest grass. All the same, I reject the school of thought that would subscribe to the inherent virtue of the under-privileged and the inherent vice of the privileged. 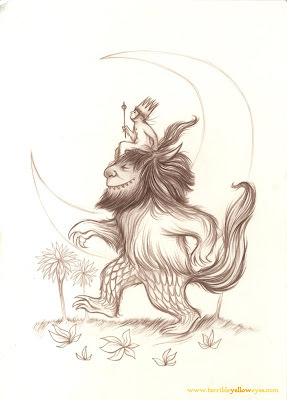 The troll is ultimately more interesting to me than the goat. 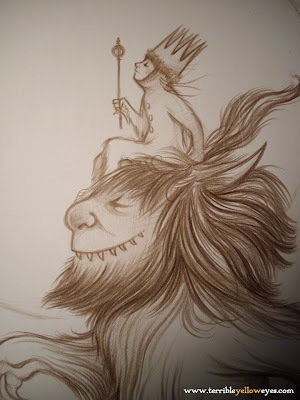 Justin had an idea that maybe the troll lost a wager with a king and was cursed to live under the bridge.